Las Vegas Sands Corp which is said to be the world largest casino operator, has been targeted by hackers. Websites of Sands casino and its subsidiaries have been defaced. The sites home page modified with the world map marking the location of sands casinos with flickering flame. "Damn A, Don't let your tongue cut your throat "the defacement message reads. 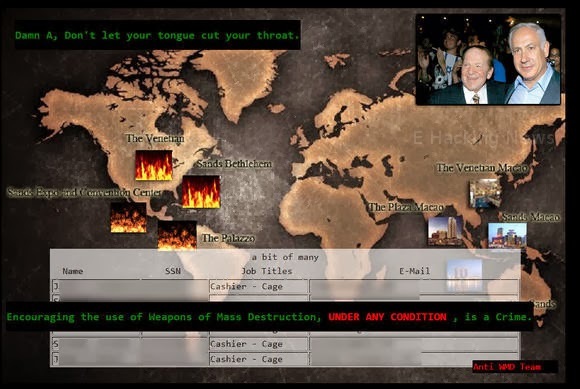 "Encouraging the use of weapons of Mass destruction, Under Any condition , is a Crime"
The defacement also contained personal information of Sands employees including e-mail id, social security numbers and other information. The sign left in the defacement suggest it is done by a hacker group identified as "Anti WMD team". However, we are not able to find any history about this group. List of affected websites are: Sands official website (sands.com), Venetian (www.venetian.com), Palazzo (palazzo.com), Sands Bethlehem (pasands.com), Marina Bay Sands (www.marinabaysands.com), Venetian Macao (venetianmacao.com), Sands Macao (sandsmacao.com) and Holiday Inn Macao Cotai Central (sandscotaicentral.com). All of the affected websites are currently showing "Undergoing Maintenance" message. Sands Spokesperson told Associate Press that the company is working with law enforcement to find out the hacker behind this security breach. The company couldn't say whether customers' card data had been compromised.